For this week’s Feast Under $5, I’m using a great shortcut- instant polenta. Polenta is very mild, so it takes on the taste of whatever you cook it with, and lends itself to the addition of cheese and herbs. The eggs provide the protein in this meal, so if you’re extra hungry you might want to put 2 in each serving. If you don’t like mushrooms, you could saute spinach and garlic instead, increasing the protein for the same amount of money. For serving, I suggest breaking the egg yolks over the warm polenta and stirring everything together- creamy and savory. In a skillet, combine a tbsp of olive oil with lemon juice, mushrooms, and parsley. Saute over medium heat until moisture from mushrooms has evaporated, remove from heat and set aside. In a large saucepan, combine milk with 2 cups of water, bring to a boil. Turn heat down to medium low and whisk in polenta until incorporated, then add butter and cheese. Stir in more water by the tablespoon if polenta is too stiff. Remove polenta from heat and cover. Poach eggs until whites are set. Spoon polenta into bowls, making an indentation in the middle of the piles for eggs. 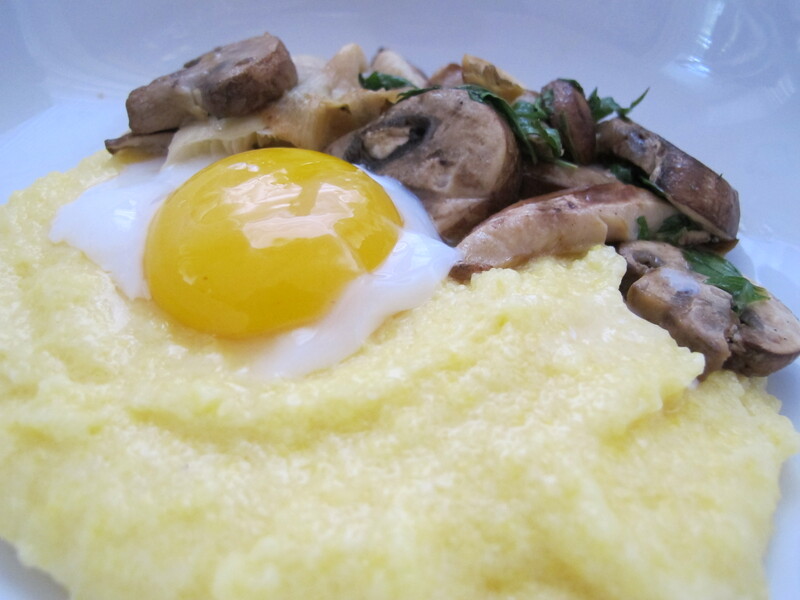 Place a poached egg on polenta, top with mushrooms. Garnish with more cheese and parsley, if desired. Remember, this cost assumes you already have the pantry staples.